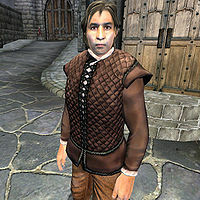 Toutius Sextius is an Imperial commoner living in Skingrad. He is also the object of the delusions of a paranoid schizophrenic, namely Glarthir. According to himself, Toutius' father and Count Hassildor were very good friends back in the day, which might explain the amount of time Toutius spends at the castle. He wakes up in his Skingrad residence every morning at 6am and wanders around for three hours. At 9am he leaves the town, heading for the castle, where he will be found wandering around the County Hall until 2pm. After returning to his house for lunch, at 3pm he exits the town once again, this time for a leisurely horse ride in the area west of Skingrad, on a Bay Horse he borrows from the Grateful Pass Stables. He will dismount at 9pm and go back to his house for a late dinner before his bedtime at 11pm. His clothing reflects his status: a quilted doublet, tan linens, and a pair of doeskin shoes make up his attire. He also carries his house key and a random amount of gold. Toutius is quite arrogant and patronizing when you try to approach him, and he obviously doesn't want to talk to people of lower standing than himself: "You're new here, or you'd know me. Toutius Sextius. My people have lived in Skingrad since the Dawn. Father and the Count were best of friends." When asked about Skingrad, he will reply: "Perhaps you should seek out a priest. Perhaps a beggar. Or guardsman. You and I, we have nothing [sic] common. What could we possibly talk about?" Toutius faces a paranoid Wood Elf with an axe. During the related quest, he will have the following to say about Glarthir: "I'm sorry, but I don't think I know any Glarthir. Wait, do you mean that strange Wood Elf that you see wandering around the city? Yes, I've seen him, but never spoken to him. He seems to be at the Low Gate every morning when I pass by on my way to the castle. Gives me the strangest looks, now that you mention it. Almost like he hates me, although I have no idea why." When you ask him about Glarthir again he will say: "Yes, the strange Wood Elf who haunts the Low Gate every morning, you said he was Glarthir. I'm afraid I know nothing else about the fellow." However, if you deem Toutius guilty in the suspected conspiracy and Glarthir includes him on his list of death, you are free to show Toutius the note: "What?! This is ... unbelievable! Of all the strange fates, to become the target of a stranger's madness ... Please, you must show this to the guards at once. My life is in your hands!" When asked about Glarthir again, Toutius will assure you: "I appreciate your warning. I'll be on the lookout for him. But please tell the guards so they can arrest him before he attacks me!" 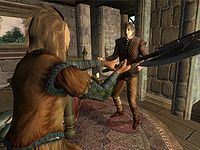 Also, if you deemed him guilty but refuse to help Glarthir, Toutius will join the People Glarthir Hates faction and will receive an unexpected visit from the Wood Elf who will actively seek him out, carrying an iron battle axe. Whether or not Glarthir is a threat towards Toutius depends on your choices during the quest, but the Skingrad citizens are aware of the problem. When asked about rumors, they will respond with: "I've heard that someone has it out for Toutius Sextius. Who'd want to hurt him?" and "I've heard rumors that someone has been keeping a close eye on Toutius Sextius. Seems harmless enough." Others will simply say: "I can't imagine who'd want to hurt Toutius." and "I'm sure it's just a rumor. I can't think of a reason why anyone would want to hurt Toutius." If Glarthir ends up taking matters into his own hands and kills Toutius, the shocked citizens will discuss: "It's unbelievable. Glarthir went after Toutius Sextius with an axe. Killed him before the guards could do anything. No one even knows why." He shares his surname with Jesan Sextius, although there is nothing to suggest they are related. He may fall to his death when crossing the bridge to the castle. This will break his related quest, Paranoia, if you have not already started it. This page was last modified on 15 November 2018, at 18:26.